You've probably read articles or papers that proclaim the benefits of moving your content to DITA: accuracy, consistency, increased productivity, reduced authoring times, etc. But you need to know by how much. How much savings? How much increased productivity? How much for YOUR project, YOUR content? Because yours is different from everyone else's. What is your project going to cost with DITA and content reuse? And if you're currently using or recently implemented DITA, how do you track the success of the project? DITA Metrics 101 can help you answer those questions. Follow the steps in this book to create custom models that estimate the cost of your content in DITA and the cost of your new processes that support the DITA content lifecycle. Then, use these models to predict the cost of your documentation project. Compare your current costs to your costs using DITA. That difference is your savings and you'll likely find that this number alone can be used justify to justify switching to DITA and structured content. DITA Metrics 101 contains a variety of spreadsheets, all part of Mark's in-depth method of identifying the savings and highlighting the ROI of switching to DITA. Creating your own copies of the spreadsheets is a time consuming and laborious process. A companion workbook containing all of the spreadsheets used in the book is available for purchase and immediate download. The spreadsheets can be used as they are, or can be modified to match your own needs. Complete instructions on doing so can be found in DITA Metrics 101, under the "Customizing the models" section. 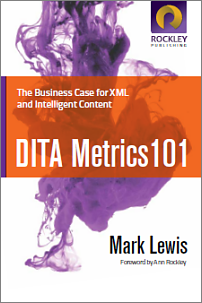 DITA Metrics 101 is now available for purchase at Lulu.com. A companion workbook is available. It contains all the spreadsheets referenced in the book and is available for purchase and immediate download.